Spilling the NSA’s Secrets: Guardian Editor Alan Rusbridger on the Inside Story of Snowden Leaks | Democracy Now! editor-in-chief of The Guardian. He is also the author of a new book on playing the piano, called Play It Again: An Amateur Against the Impossible. Three-and-a-half months after National Security Agency leaker Edward Snowden came public on the U.S. government’s massive spying operations at home and abroad, we spend the hour with Alan Rusbridger, editor-in-chief of The Guardian, the British newspaper that first reported on Snowden’s leaked documents. The Guardian has continued releasing a series of exposés based on Snowden’s leaks coloring in the details on how the NSA has managed to collect telephone records in bulk and information on nearly everything a user does on the Internet. The articles have ignited widespread debate about security agencies’ covert activities, digital data protection and the nature of investigative journalism. The newspaper has been directly targeted as a result. 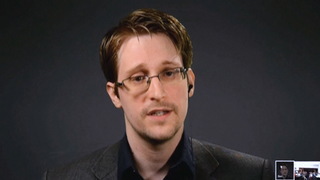 Over the summer, the British government forced the paper to destroy computer hard drives containing copies of Snowden’s secret files, and later detained David Miranda, the partner of Guardian journalist Glenn Greenwald. Rusbridger, editor of The Guardian for nearly two decades, joins us to tell the inside story of The Guardian’s publication of the NSA leaks and the crackdown it has faced from its own government as a result. JUAN GONZÁLEZ: Today, in a Democracy Now! special, we spend the hour with Alan Rusbridger, editor-in-chief of The Guardian newspaper. Three-and-a-half months ago, on June 5th, The Guardian revealed the National Security Agency is collecting the telephone records of millions of customers of Verizon under a secret court order. On the following day, the paper revealed the existence of a secret program called PRISM that gave the NSA direct access to the systems of Google, Facebook, Apple and other U.S. Internet giants. Four days later, The Guardian revealed the source behind the leaks was a National Security Agency contractor named Edward Snowden. EDWARD SNOWDEN: Any analyst at any time can target anyone, any selector anywhere. Where those communications will be picked up depends on the range of the sensor networks and the authorities that that analyst is empowered with. Not all analysts have the ability to target everything. But I, sitting at my desk, certainly had the authorities to wiretap anyone, from you or your accountant to a federal judge, to even the president, if I had a personal email. AMY GOODMAN: Since early June, The Guardian has continued to publish a remarkable series of exposés based on Edward Snowden’s leaks, coloring in the details on how the NSA has managed to collect nearly everything a user does on the Internet. The articles have ignited an international debate about the NSA’s activities, digital data protection and the nature of investigative journalism. And the paper has been directly targeted as a result. JUAN GONZÁLEZ: In August, David Miranda, the partner of Guardian reporter Glenn Greenwald, was detained and questioned at Heathrow Airport under Schedule 7 of Britain’s Terrorism Act. Miranda was detained for nine hours and only released after British authorities seized his mobile phone, laptop, cellphone and USB thumb drives. Soon after Miranda’s detention, The Guardian revealed the British government threatened legal action against the newspaper unless it destroyed computer drives containing copies of Snowden’s classified documents or handed them to British authorities. AMY GOODMAN: Well, for more, we’re joined now by The Guardian editor-in-chief, Alan Rusbridger. He’s been editor of the newspaper since 1995. Alan Rusbridger, welcome to Democracy Now! ALAN RUSBRIDGER: I’m very happy to be here. AMY GOODMAN: Did you have trouble coming into the United States? ALAN RUSBRIDGER: No, I came through very easily. AMY GOODMAN: How about the rest of your staff? ALAN RUSBRIDGER: There have been—there have been moments when they’ve been fairly comprehensively frisked, either leaving or coming in. And Glenn Greenwald, who’s been doing most of the reporting, is not risking moving around at the moment, which is probably sensible. AMY GOODMAN: Do you think he would be arrested if he came back to the United States? Glenn is an American citizen. ALAN RUSBRIDGER: Yeah, I hope he wouldn’t be. One of the things that I’ve tried to make a point of is that we’ve moved our reporting to America, because I think America’s rules around press freedom, First Amendment and so forth should protect this kind of reporting. So I very much hope, with the eyes of the world on America, that somebody who has done the reporting that has got this matter into public debate wouldn’t be punished for it or criminalized. JUAN GONZÁLEZ: Could you take us back to the beginning of this worldwide, really, exposé that you’ve been in the forefront of, your paper has been, how the story first came to you and your decision to begin to print it so soon after you received the initial information? ALAN RUSBRIDGER: Well, I think it’s quite an interesting story about the old world and the new world. So there’s the Fourth Estate, newspapers; there’s the Fifth Estate, bloggers. And this is a union of the two. We hired Glenn Greenwald, who is a blogger and who has written knowledgeably and, some people might say, obsessively about the subject over the last few years. In Hawaii, a 29-year-old NSA analyst was clearly reading Greenwald and was so troubled by what he was doing in his work that he wanted to find somebody knowledgeable to give this material to. So he came to Glenn. Glenn, by now, was working for The Guardian, and that’s how it all kicked off. AMY GOODMAN: Talk about how exactly that happened. You have Edward Snowden, who flies to Hong Kong, and then take it from there, with your columnist Glenn Greenwald, Laura Poitras, the filmmaker, also another of your reporters who went to Hong Kong to meet Edward Snowden. ALAN RUSBRIDGER: Yeah, there was about two weeks when they were all essentially closeted in the same hotel room. It was a rather unreal period, for anyone who has watched a Hollywood movie about these kinds of things—agents on the run, stashes of secrets. But they worked together, and it was important for me that there was a Guardian reporter, a conventional reporter, in the room along with Glenn and Laura. AMY GOODMAN: That was Ewen MacAskill? ALAN RUSBRIDGER: That was Ewen MacAskill, who’s a Scottish reporter who’s been on The Guardian for years and years and years, very experienced, not easily impressed reporter. And between them, they started to go through this stash of material that Greenwald had—that Snowden had with him. And we obviously had to establish Snowden was who he said he was and that the material was what he said it was. And at the end of about two weeks, we started to publish material based on it. JUAN GONZÁLEZ: And did the decision about what to publish first, and given the fact that it’s been string of continuing revelations that have come out, and—how was that decided on? ALAN RUSBRIDGER: Well, to begin with, we needed some help from Snowden to point us to what he thought was important. This is not a world that’s easily—these are not documents in which the stories sit up and show themselves. This is a complex world. A lot is written in acronyms, if not in actually code, and so we had to be guided to—initially, to some of the stories that Snowden felt were most newsworthy. And it was important for him, I think, that the world—the world had some sense of what he was trying to say before he outed himself. And so, we started doing stories about this intersection between Silicon Valley, the telecom companies, and the intelligence agencies, in what is, I think, something new, which is putting entire populations under a form of surveillance. So, that’s what we did in that first week before Snowden came out and revealed himself to be the whistleblower. AMY GOODMAN: Edward Snowden, himself, had signed up for the special forces in the United States, broke both his legs in a training accident and then left. How did you confirm his credibility on all of this, who he was? ALAN RUSBRIDGER: Well, they all spoke to him for a long time, and that’s where having my Scottish Presbyterian reporter in the room was important for me. I wanted him to make—to form a judgment about character. I mean, we obviously did all the tests of who he was, and that all stacked up. He obviously was who he said he was. AMY GOODMAN: Worked for Booz Allen, was a subcontractor for the NSA. JUAN GONZÁLEZ: And I know that you had numerous conversations with—certainly with British intelligence subsequently, but before the first articles came out, was there any contact with American intelligence or British intelligence on your part to warn them of what was coming? ALAN RUSBRIDGER: Well, the first four stories were all NSA rather than GCHQ, and they were all edited out of New York. And we were in touch with the agencies via the White House, and we warned them of what we were going to publish. And we had sometimes helpful dialogue, sometimes robust dialogue about what we were going to do, but it was important for me that we gave them the chance to respond and to make plain any concerns that they had about any particular thing. JUAN GONZÁLEZ: And was there any effort on their part to dissuade you from publication? ALAN RUSBRIDGER: Yeah, they were—I mean, they told us why they thought we shouldn’t publish some things. There were one or two things that were helpful, because we didn’t want to go into this behaving irresponsibly or to put agents in danger, or operations. And so, I think it was important to have those conversations. AMY GOODMAN: Edward Snowden also made that a requirement, isn’t that true, that people not be exposed? AMY GOODMAN: We’re talking with Alan Rusbridger, go to break, and we’ll be back with him for the hour. He is the editor-in-chief of The Guardian for almost two decades, also author of a new book on playing the piano and his work at The Guardian. It’s called Play it Again: An Amateur Against the Impossible. We’ll be back in a minute. AMY GOODMAN: Our guest is Alan Rusbridger. He’s editor-in-chief of The Guardian newspaper for almost two decades. Can you talk about when the British government called you and said they wanted your hard drives, they wanted this information? ALAN RUSBRIDGER: We had two big conversations with the British government, one at the end of June and one about halfway through July. And it became obvious to me that their tone was hardening. I think they felt this story was out of their control, and they—there came a point where they directly threatened legal action. Now, in the U.K., the government can move and stop publication. I don’t think that’s possible, since the Pentagon Papers, in the U.S. And there came a point in which we—it was obvious we only had two options. One was to return the material, and the other was to destroy it. It didn’t actually matter much to me, because the material was already in America, and I had already shared some of it with The New York Times, so it was going to make no difference to the reporting. But what I didn’t want to do was to get into a big legal action, which could potentially have frozen it all. AMY GOODMAN: And so, what did you allow to happen? ALAN RUSBRIDGER: So, this bizarre thing happened, the most bizarre thing that I think has happened in my journalistic career, which was that two technical people from the GCHQ, which is the Government Communications Headquarters—it’s the equivalent of the NSA—came into The Guardian and supervised our destruction of the lap-books on which—the laptops on which we had been working. AMY GOODMAN: So you said you wouldn’t give it to them, but you’d destroy your own hard drives? ALAN RUSBRIDGER: I wouldn’t give it to them, because, I mean, I think journalists generally don’t hand material back to governments. But also, there was always the threat hanging in the background of criminal action against The Guardian. And I don’t know what these—or against Snowden, and I don’t know what these discs would have told them about who had been looking at this material, and I didn’t want to give them evidence that could be used against The Guardian. It’s difficult, in which—in which you have this potential of criminalizing reporters who are informing the debate that everyone says they want to happen. So I wouldn’t give it back to them, and so the compromise we agreed on was that we would smash it up. And it turns out to be harder to smash up a computer in ways that would satisfy the spooks than perhaps you imagined. AMY GOODMAN: How did you do it? ALAN RUSBRIDGER: Well, first of all, you take it apart. You reveal all its guts. AMY GOODMAN: This is what you’re doing with the GCHQ guys there. AMY GOODMAN: You carry this with you? ALAN RUSBRIDGER: I carry it with me as sort of a little memento. I think it’s a rather sinister reminder of the intersection of state and journalism. But it’s not just the hard drive. You have to destroy the logic board. There are specific chips on the trackpad and the keyboard. And so, it was a very long, dusty, rather noisy work to smash up all these computers. JUAN GONZÁLEZ: But obviously, there were other copies of the same information in other countries. JUAN GONZÁLEZ: And I’m wondering if you would comment on this world now, where governments have a lot of trouble being able to snuff out information in one country because of our international information system now that makes it possible for it to crop up in another country? ALAN RUSBRIDGER: Well, it goes back to a little of what we were saying about earlier, that here was this intersection between the Fourth and the Fifth Estate. So, one of the copies was in Rio, where Glenn Greenwald lives, and I would guess that the intelligence agencies find Glenn Greenwald a difficult customer to deal with, because he’s not like a big press organization that you can march in and threaten. And as we say, there were copies in New York. But I think this is really two sides of the same coin. What we’re talking about is the collaboration of intelligence agencies around the world to snoop on a global intelligence network. So, that’s what they’re doing. But that same global network, the Internet, is used by all of us and to spread information. So the thing that makes the snooping possible is the thing also that makes it so hard for them to get hold of a piece of information and snuff it out. JUAN GONZÁLEZ: And I’m wondering also, the—in your own country, what has been the press coverage of the other competing media in your country like, and the reaction among the British population to the revelations of The Guardian about all of this international eavesdropping of the NSA and its allied intelligence agencies? ALAN RUSBRIDGER: Well, it’s a story that, as you know, has sparked an incredible debate in the United States. It has in—throughout Europe and in many other parts of the world. It’s been quite quiet in the U.K., and I’m not entirely sure why that is. It may be for unworthy competitive reasons—I hope not. It may just be that in America you have, in living memory, had McCarthy. You’ve had Nixon. You’ve had Hoover. In Germany, they’ve had the Stasi. Maybe in Britain we’re a little bit complacent about this kind of stuff. I think, actually, people who read these stories and who understand what they’re saying are worried, but it hasn’t engendered quite the debate that is has elsewhere. AMY GOODMAN: Has The Guardian made any deal with the British government not to publish certain information? ALAN RUSBRIDGER: We’ve made no deals with anybody. I mean, occasionally we’ve had conversations where the British government has said, “We would rather you didn’t publish anything, but if you are going to publish, there is this little bit that we regard as endangering X, Y or Z.” And sometimes we have agreed with that; more often, we haven’t. AMY GOODMAN: I wanted to go to David Miranda for a minute, David Miranda, Glenn Greenwald’s partner, who was detained last month by the British government as he was traveling through London’s Heathrow Airport. He was held for nine hours under a British anti-terrorism law. He faced repeated interrogation, had his belongings seized, including thumb drives carrying information Glenn used in his reporting on NSA surveillance. After his release, he appeared on Anderson Cooper’s show on CNN. ANDERSON COOPER: Did they actually ask you anything about terrorism? DAVID MIRANDA: No, they didn’t ask me anything about terrorism, not one question about it. And I think it’s really weird, because I was in there for like eight hours without talking to anybody outside. And like, they were just like keeping me. I have to ask them, “Do I have to answer this?” And they just telling me, like, “If you don’t answer this, you’re going to go to jail.” And you know that’s a big thing, because, like, when they say like that I was under this law, this is terrorism, you know what U.K. and United States do. They have all the powers in the world to do anything they want over this, because—I’ve been following Glenn and his career for the past eight years, and I have seen many stories that people are picked up in different countries, getting to this Guantánamo and just like staying in prison, and they have vanished. Nobody has seen them. So, in that moment, I was like really afraid what would happen to me. DAVID MIRANDA: And I was—you understand that I was for eight hours without talking to anybody on outside of the world. I didn’t know what’s happening, and they keep threatening me about me going to the jail, with that law. AMY GOODMAN: That was Glenn Greenwald’s partner, David Miranda. Speaking to the BBC, British Home Secretary Theresa May defended the government’s actions, saying Miranda may have been carrying information useful to terrorists. HOME SECRETARY THERESA MAY: I think it’s right, given that it is the first duty of the government to protect the public, that if the police believe somebody has in their possession highly sensitive, stolen information which could help terrorists, which could lead to a loss of lives, then it is right that the police act, and that’s what the law enables them to do. AMY GOODMAN: And the White House acknowledged the British government had given the U.S. a heads up about its plan to detain David Miranda, but refused to criticize Britain’s actions. White House Deputy Press Secretary Josh Earnest took questions on the issue in August. REPORTER: You talked about the Mubarak detention as being an Egyptian legal matter. You talk about Morsi, politically motivated detention. And then, with regard to Mr. Greenwald’s partner, you called it a mere law enforcement action. Given that the White House has never been shy about criticizing detention policies overseas, do you have any concerns at all about the U.K.’s law enforcement action in this case? DEPUTY PRESS SECRETARY JOSH EARNEST: Well, what I can say is, I don’t have a specific reaction other than to observe to you that this is a decision that was made by the British government and not one that was made at the request or with the involvement of the United States government. REPORTER: So—but you’re not going to go as far as to say it’s wrong or is cause for concern. You’re just separating yourself entirely from it. DEPUTY PRESS SECRETARY JOSH EARNEST: Well, I’m separating—what I’m suggesting is that this is a decision that was made by the British government, without—you know, not a—without the involvement and not at the request of the United States government. AMY GOODMAN: Alan Rusbridger, can you respond to what the U.S. and British governments said? Also, it was the day after Miranda was taken that you revealed what happened to The Guardian, which was a few weeks after you actually destroyed the hard drives. Why did you choose that—why was that the key moment for you, that you decided you’d reveal what happened to The Guardian’s hard drives? ALAN RUSBRIDGER: Well, I think it’s quite significant in that clip that we’re talking there about the British government taking this decision, which is not actually what’s suppose to happen with that law. This law is an obscure bit of the Terror Act, Section 7, which is supposed to be police acting randomly in ports and airports. And why this was wrong to use this law is because it accords none of the rights to journalistic material that would have happened if they had picked up David Miranda and arrested him, as they could have done under other acts, or if they had taken him into Heathrow car park as opposed to the transit lounge. So it was just a misuse of terror legislation against journalism. And that, to me, is wrong. And if people are saying that it was the government took that decision, then that was even more wrong. And you’re right to say that I then revealed about the smashed-up discs. There were logistical reasons at the time why I couldn’t write about that. And I waited to see how the British government was going to play this, but it seemed to me at the point that they were going to misuse those kind of laws against reporting, that was the moment to share what else the British government had been doing. I thought it was right that the readers should know. JUAN GONZÁLEZ: And, Alan Rusbridger, I’d like to ask you about the Edward Snowden odyssey since the initial revelations, in his travel from Hong Kong, then to Russia, and becoming an international standoff between the United States and Russia over whether he’d be handed back, whether that’s complicated your ability to continue reporting on this at all? Because, obviously, the source of your information is now not as readily—as easily available as he was—as he was in June and July. ALAN RUSBRIDGER: Well, I think he knew, and he told us that, in leaking this material, he knew that this was going to be immensely complicating for his life, to put it mildly. And either he was either going to be on the run, or he was going to end up like Chelsea Manning. And either way, it was going to be difficult to communicate with him. We didn’t know that he was going to end up in Russia. I don’t know if even he knew at that point that he was going to end up in Russia. Glenn is still in contact with him via encrypted email, so we still have some contact with him. But it is a complicated story to report. We assume—this may be wrong, but we assume that our communications will be intercepted, because that is part of the story that we’re writing about, which is why people have to be on planes occasionally carrying material which then get intercepted by the police. So it’s not an easy story to report. JUAN GONZÁLEZ: And the impact that this has had, much like the original WikiLeaks revelations in various countries around the world—in Brazil, obviously, in Europe—did you expect at the beginning that this would have the ramifications and the explosiveness that it’s had in various countries, not just the United States and on the U.K.? ALAN RUSBRIDGER: Well, I think the bit that is sometimes missing from the American debate, the president places great emphasis on the fact that America doesn’t spy on Americans on American territory, as if that was the only thing that mattered. And I thought it was very interesting that Mark Zuckerberg from Facebook said the other day, “Well, that’s no use to us if we’re trying to build an international business.” So, I think—I think Americans haven’t quite understood the anger of other states, of people living in Germany, say, that Americans feel free to spy on anybody else in the world. And you just have to sort of reverse that and think how would Americans feel if Germans were spying on them, or the Chinese. Well, we know how people feel about the Chinese. And then you get to this further dimension, that it appears that what the NSA had done is to weaken the systems under which everything is kept secret—banking transactions, medical transactions of ordinary Americans, but also the rest of the world, by building these so-called trapdoors. Now, if the—the cryptologists seem to say, if you build a trapdoor that the NSA can get through, then probably the Chinese can, too, and criminals. So that’s—I think this last story about the weakening of the security of the Internet has international ramifications which are beginning to be felt. AMY GOODMAN: Why did you choose to collaborate with The New York Times and ProPublica in revealing the National Security Agency as successfully foiling much of the encryption used by people to protect their privacy? ALAN RUSBRIDGER: Well, we had to find American partners, because it was clear that our reporting was going to be made very difficult in the U.K. And actually, if you look around America, you’ll slightly—I mean, there are not limitless options of people who can handle a very big story. I mean, it takes up a lot of resources, a lot of technical knowledge, legal backup. And New York Times is a great paper with that kind of backup, and ProPublica is a really interesting example of a much smaller operation but has got a lot of expertise around these kind of subjects. AMY GOODMAN: Did you also want to spread the information around, in case somehow your access to it is jeopardized? ALAN RUSBRIDGER: I think that’s prudent, and that was one of the reasons we went to both ProPublica and The New York Times. I think the more people that are involved—you don’t want a limitless number of people, but if you have a number of people involved, it makes it much harder just to lean on one. AMY GOODMAN: I’m just looking at the New York Times public editor rebuking her own paper—this is Margaret Sullivan—saying, “Many Times readers have been writing to me for several days about a story The Guardian broke last week, describing how the United States routinely shares with Israel intelligence information that the National Security Agency gathers on American citizens.” Can you talk about what you broke and what The New York Times, well, dragged its feet on? ALAN RUSBRIDGER: Well, this is another one of those stories that describes the intersections between the American intelligence agencies and what they’re prepared to share with other governments. So, we obviously thought it was significant to write about what was being shared with Israel, and under what terms, and whether the terms that covered Israel’s use of that was the same as what would be covered in America. That felt a significant story to ask. But one of the advantages of going into these kind of collaborations is that The New York Times is free to form its own opinion of the material. And so, we’re all coming to these stories from a slightly different angle, which I think is healthy. But, obviously, their own ombudsman felt that was a story they should have covered. AMY GOODMAN: I mean, raw intelligence is what the U.S. was sharing that The Guardian exposed with Israel, right—actual phone calls, not only metadata, but—and then saying to Israeli intelligence, “You decide what to do with it”? ALAN RUSBRIDGER: That feels to me like a significant story, but I don’t want to criticize the judgments of others. AMY GOODMAN: Let’s break, and then we’ll come back to this discussion. Alan Rusbridger is editor-in-chief of The Guardian for almost two decades. The Guardian has been exposing the NSA story since they broke it in June. We’ll be back with Alan Rusbridger in a moment. AMY GOODMAN: Chopin, “Ballade No. 1 in G Minor,” which plays prominently in our guest’s book and his life. Alan Rusbridger, editor-in-chief of The Guardian, has written a book, Play It Again: An Amateur Against the Impossible. We’re going back to talk about what you’ve exposed, but you have just come out with this book. Talk about how your piano playing, how your interest in music and mastering this piece relates to what you’re doing with The Guardian. ALAN RUSBRIDGER: This is a kind of diary. We were working on WikiLeaks phone hacking, so it was a diary of that period. But it’s also a book about creativity in midlife. I think that the choices we make about what to do with our time when we’re not working, and whether the value of painting or reading or writing poetry or music, these sources of creativity that lie within us, and I spent 18 months—I went back to playing the piano later in life. I tried playing this extraordinarily difficult piece of music, this first Chopin Ballade. And so, it was an interweaving of this thing I was doing almost to take the stress and pressure of my life out of it, and at the same time hold down an editing job on a big newspaper. So, I hope it’s a book that will encourage people who gave up the piano or always wished they had played the piano, and to persuade them that there is time—you can make time in your life to do these things if you think they’re important. ALAN RUSBRIDGER: Well, I mean, I know some people have a weary shrug, and they say, “Well, spies spy. You know, what’s new about that?” But I think it is surprising, the degree to which apparently friendly nations are eavesdropping each other at heads-of-state level or Cabinet level. We did the story about the G-20 meeting in London, in which the British government set up a kind of phony tent, an Internet cafe, in which delegates could go in and do their emails, not knowing that the British government or the British intelligence services was logging all their email passwords in order to carry on spying on them when they went home. Most of these were friendly allies, and there was no justification for that, except the “economic well-being” of the U.K. So, I think these are troubling revelations. Brazil is another country. And I think it gets to be a big, big story for American innovation and business, if the rest of the world comes to associate these companies with forms of surveillance. That is going to damage American companies. And I think the Silicon Valley companies know this, and they are worried. And it also applies to the standards, the international standards by which the Internet as a whole operates, and this sense that the Internet is, in some sense, American, or that the America should be—have an overall role in deciding these standards. There’s going be a lot of pushback on that in the future. And all these things—you know, there’s a short-term gain in this kind of behavior and a long-term loss. JUAN GONZÁLEZ: —threatening to try to find a way to get—extricate Brazil from a U.S.-dominated Internet. ALAN RUSBRIDGER: Well, you can understand it, can’t you? I mean, again, put it the other way around: If we discovered that Brazil was trying to listen to President Obama’s phone calls or emails, there would be outrage. So, you can understand why other states just are offended by this kind of behavior. AMY GOODMAN: Earlier this month, while in Sweden, when President Obama was on his way to the G-20, in Saint Petersburg, where he faced, you could say, a wall of BRICS—as in Brazil and India, China, South Africa—Obama said he’s working to reassure foreign allies following the wave of revelations surrounding U.S. spying on other governments. PRESIDENT BARACK OBAMA: I can give assurances to the publics in Europe and around the world that we’re not going around snooping at people’s emails or listening to their phone calls. What we try to do is to target, very specifically, areas of concern. We are consulting with the EU in this process. We are consulting with other countries in this process, and finding out from them what are their areas of specific concern, and trying to align what we do in a way that I think alleviates some of the public concerns that people may have. AMY GOODMAN: And he says the debate would have happened anyway, without Edward Snowden. ALAN RUSBRIDGER: Yes, well, the debate never did happen, did it? Because the instinct of these agencies is always going to be to keep it as secret as possible and to criminalize people who talk about it. So that debate didn’t happen until Snowden came along. And who is overseeing this? And do you trust them? I mean, Dianne Feinstein, a great public servant, but does she really understand the finer details of cryptology and encryption and the capabilities which—you know, which are expanding exponentially? And can they really match up what the laws were intended to do and what engineers are now capable of doing? These are the questions. And I think it’s not enough to just say, “Take us on trust. We’re not doing this. We’re not doing that,” because these secret courts, the FISA courts, we’re now learning some of the things that were troubling them that they never made public. And so, it’s a lot to take on trust. AMY GOODMAN: You know, Alan Rusbridger, The Guardian has exploded onto the global scene with the exposé of News of the World and their phone hacking, that forced Murdoch to close News of the World. Interestingly, it was a story about phone hacking. Can you talk about that progression of The Guardian to exposing the WikiLeaks documents, working with Julian Assange, to what you’re seeing today? I mean, The Guardian has just done a remarkable series of exposés. ALAN RUSBRIDGER: Well, The Guardian has always been something of an outsider. Started in Manchester in 1820, has been owned by a family trust since 1936, so it has no owner. We make our own editorial decisions, so we have a high degree of independence. And it seemed that after 2000, a third of our audience was in America, which is why we’ve moved to America. We now have an operation of 55 people in America and an audience of many millions. About a third of our audience of 42 million is now in America. And I think there’s just an appetite for this kind of reporting. It’s quite rare now. We don’t have shareholders saying, “We want our returns and cutting budgets.” And so, I mean, it’s a bit—it’s a bit like what you’re doing. It’s keeping very much an international focus, because I think most American citizens realize their lives cannot be understood in a purely national context. The things to do with security, economics, technology, the environment are stories that can only be told internationally. JUAN GONZÁLEZ: Well, I wanted to read an excerpt from a recent letter sent by the National Security Agency to family members of its employees. The letter, dated September 13th, is signed by NSA director, General Keith Alexander, and Deputy Director John Inglis. It says, quote, “Some media outlets have sensationalized the leaks to the press in a way that has called into question our motives and wrongly cast doubt on the integrity and commitment of the extraordinary people who work here at NSA/CSS—your loved one(s). It has been discouraging to see how our Agency frequently has been portrayed in the news as more of a rogue element than a national treasure.” I’m wondering, your response to the—I mean, obviously the allegations of sensationalized reporting allude to The Guardian as well as other press outlets. ALAN RUSBRIDGER: Well, we obviously reject that. I think we’ve been very careful in our reporting, and actually, the intelligence chiefs, when they speak in private, have been graceful enough to acknowledge that we have been responsible. I can understand why you would write a letter like that. And we’re not saying that the people who work inside the NSA are bad people. I imagine they have very talented engineers who are capable of doing extraordinary things. I think what we’re saying is that there has to be a wider debate, because it’s not just about national security. There are other interests in society—privacy, civil liberties, of reporting—which have to be weighed against security. And so, if you write about this, you’re not saying that the NSA is full of bad people. That would be silly. So, I perfectly understand that you write a letter to the families saying that much of what you do is good and important, which it is. JUAN GONZÁLEZ: I’m wondering also, since we mentioned earlier your involvement with the WikiLeaks scandal, as well, your sense of Julian Assange? He’s still—he’s still in England, basically in detention, effectively. And your sense of his role in terms of being able to bring out to the rest of the world these secrets that the U.S. military was and the U.S. government was preventing its own citizens from seeing? ALAN RUSBRIDGER: Well, I think Assange had a very good and simple idea, which was about liberating material. And in a sense, what we tried to do there is what we’re doing here, which is to root our reporting on the American First Amendment. So, you know, even in the U.K., a mature democracy, this reporting was impossible. And I think America should take pride in that, that you have this written constitution that encourages this kind of reporting. And I think if you thought how much we would welcome whistleblowers from Iran or China or Russia, if we could find out the kind of hinge that Assange imagined, in which this material could be safely leaked and protected by the highest standards of free speech, that would be a good thing. It went a bit wrong with Assange, and he’s sort of out of action in the Ecuadorean embassy in London. ALAN RUSBRIDGER: For better or worse, yes. But he—but I think he’s not—he’s been able to operate as effectively as he could have done. But that doesn’t mean the idea was wrong. I think the idea was a good one. And that’s why I think, for me as an outsider, when I see Chelsea Manning given a 60-year sentence, you think, “What kind of signal does that send whistleblowers?” Because whistleblowing—as I say, if we had a whistleblower inside the Iranian nuclear project or inside the corruption in some parts of the Chinese government, we would welcome that. And so, there are kind of universal standards, and that’s what civil liberties is all about: You have universal standards of human rights, and you have to be careful to observe those and not to bend them and start using terror legislation against journalism just when it affects you. AMY GOODMAN: Do you think journalism is threatened? ALAN RUSBRIDGER: Well, I think journalism is certainly threatened by this kind of mass surveillance, yes, because it’s impossible to have confidential sources in a world in which algorithms can immediately work out who you’ve been talking to. That’s a big threat. AMY GOODMAN: Alan Rusbridger, I want to thank you very much for being with us, editor-in-chief of The Guardian for almost two decades. He has just published a book, Play It Again: An Amateur Against the Impossible. He’ll be speaking on Wednesday evening at the New York Public Library. That does it for our show. Breaking news from Egypt: An Egyptian court has banned the Muslim Brotherhood group and ordered its assets confiscated.